Biosecurity is the protection of the economy, environment and community from negative impacts associated with pests, diseases and weeds. 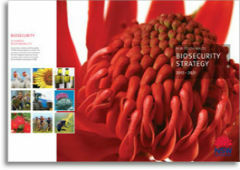 The NSW Biosecurity Strategy is based on the principle of shared responsibility and has been prepared to increase awareness about biosecurity issues and provide a framework for biosecurity management in NSW. It aims to highlight why biosecurity is important for NSW and identifies four key goals and a number of outcomes and strategies for implementation to manage risks effectively. Everyone can contribute to the NSW Biosecurity Strategy by appreciating the importance of the strategy and by being aware of, and participating in, biosecurity issues. For more information email biosecurity@dpi.nsw.gov.au. Or call the NSW DPI Biosecurity Helpline on 1800 680 244. The NSW Biosecurity Strategy sets out the government’s long-term objectives for how we will work together to manage biosecurity in NSW. The strategy will be underpinned by policies, strategies and implementation and operational plans that will provide a detailed road map of how the outcomes of this Strategy will be achieved. Specific actions, targets and time frames for delivery will be outlined in more detail in these underpinning documents and will be reported against annually or as required.